The foundations have been laid for The Tower at Dubai Creek Harbour, which is set to add a new dimension to the Dubai skyline. The iconic structure, located at the heart of the six-square-kilometre Dubai Creek Harbour, just 10 minutes from Dubai International Airport, is being developed by Emaar Properties in a joint-venture with Dubai Holding. Now the pile foundations have been completed, the first structural facets will soon become visible, Emaar Properties said in a statement. 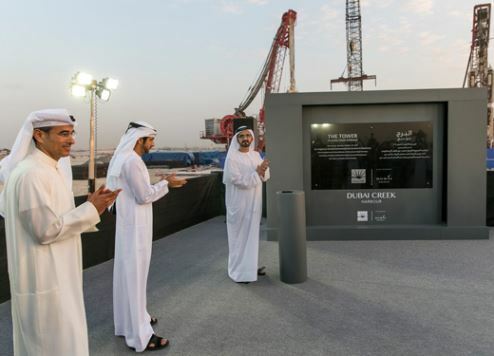 The foundation work on The Tower at Dubai Creek Harbour sets a new world first. The pile was tested to a load of more than 36,000 tonnes – the maximum carried by a single foundation pile to date – and a statement on its strength and durability. More than 145 barrette piles have been used to form the foundations for the skyscraper, which has been designed by Spanish-Swiss architect Santiago Calatrava Valls. The Tower will employ the latest construction and engineering techniques to meet its planned construction schedule. The building will feature several observation decks providing visitors with 360-degree views of the city. The Tower’s key features also include The Pinnacle Room and VIP Observation Garden Decks that recreate the splendour of the ‘Hanging Gardens of Babylon,’ one of the Seven Wonders of the Ancient World. Dubai Creek Harbour is located on Dubai Creek, overlooks the Downtown Dubai skyline and is near the Ras Al Khor Wildlife Sanctuary, a biologically-diverse wetland reserve that is home to more than 67 species of water birds, protected under the UNESCO Ramsar Convention. The Tower will also be linked to a retail district, which will be one of the largest in the world.